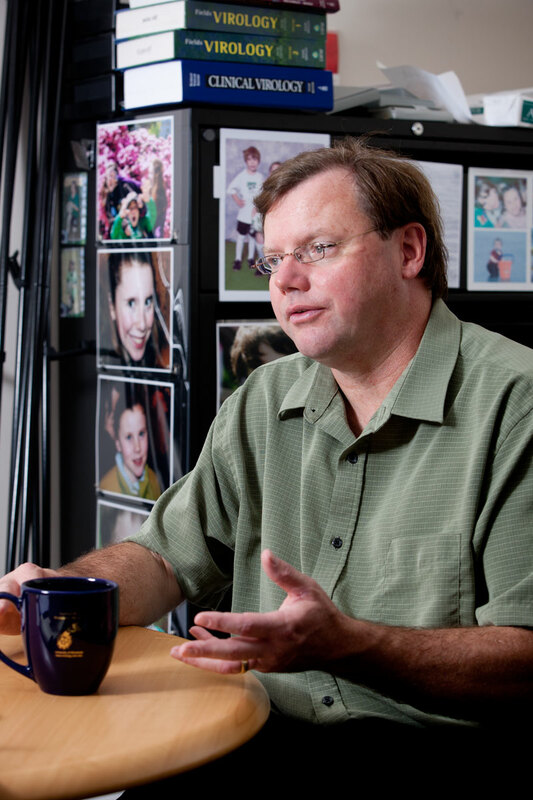 John Arends (’77 journalism) has devoted much of his life to telling the Jack Trice story. And now it’s one step closer to getting the national attention it deserves. We profiled John as part of the VISIONS Across America project back in September 2012. Since then I’ve eagerly followed his progress toward getting his Jack Trice movie screenplay produced. Just last week it was announced that John was chosen as one of six screenwriters to travel to Las Vegas for the second-annual Black List Screenwriters Lab. Hosted by Tony Hsieh’s Las Vegas Downtown Project, the lab is a week-long intensive workshop with professional mentors focused on elevating the writers’ work and preparing them for the “realities of life” in the profession. The Black List is an online community where moviemakers find scripts to make and writers to write them … and where screenwriters find moviemakers to make their scripts and employ them. 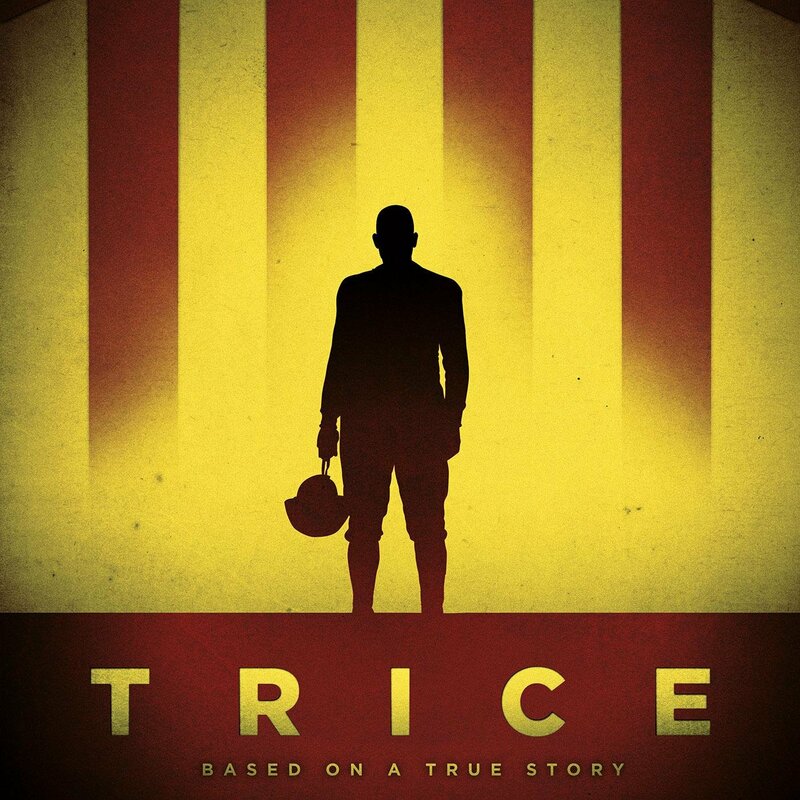 John says Trice has been trending on the Black List website for more than a year. What a phenomenal experience we’ve had the last two weeks! Jim and I had an opportunity to meet with so many friendly, passionate, successful Iowa Staters in the upper Midwest states of Michigan, Illinois, Wisconsin, and Minnesota. It never ceases to warm my heart that Iowa State grads are doing such amazing things all over the country. We began our 10-day journey in Dearborn, Mich., world headquarters for Ford Motor Company and home to our own Matt Dunker (’00 mechanical engineering). 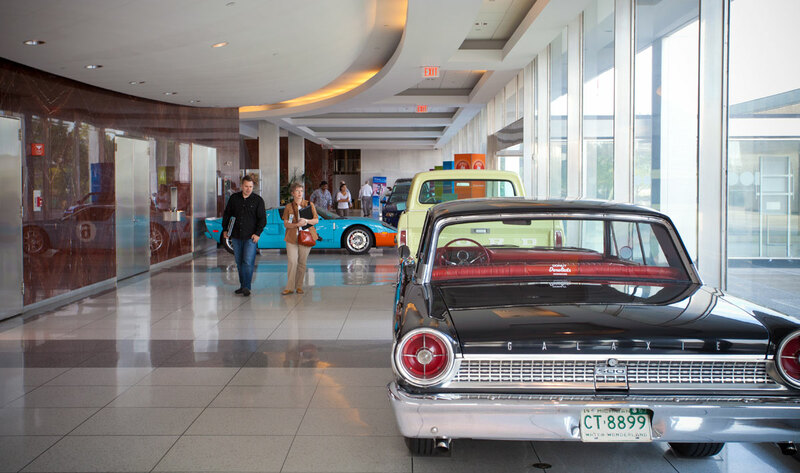 Matt is a vehicle architect for Ford, and he’s had a love affair with cars since he was just 15 years old. Matt will be featured in our special VISIONS Across America issue in spring 2014. That’s Matt and me above at Ford World HQ. Also in Michigan we met with Greg Clites (’74 meteorology, MS ’81 civil engineering/water resources). Greg lives in Ann Arbor and teaches high school math in nearby Tecumseh. Greg struck me as being genuinely interested in students and their success – the kind of math teacher I wish I had in high school. 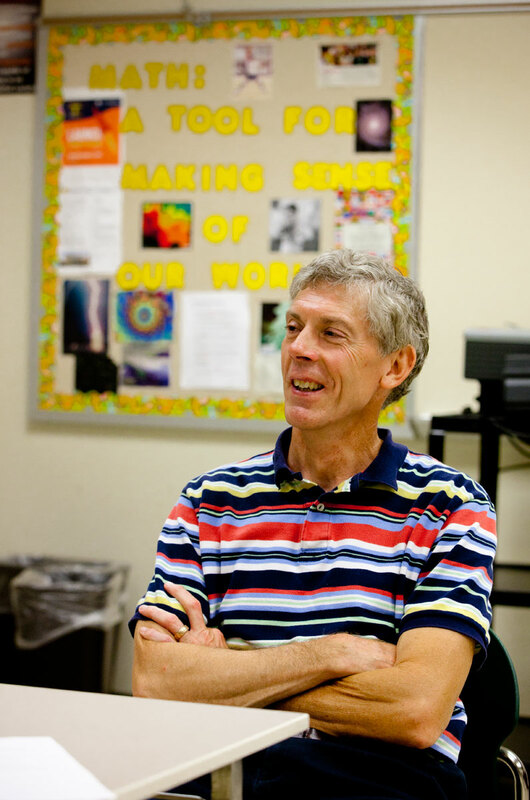 His approach to teaching makes math relevant in students’ lives. I’ll feature Greg (shown at right in his Tecumseh High School classroom) in the next several weeks on this blog. Between our appointments with Matt and Greg we visited the University of Michigan campus. The fall semester had not yet started, but the campus and downtown Ann Arbor were already lively and vibrant. I always think it’s a treat to visit university campuses when we travel, so we try to make the time to do that whenever we can. 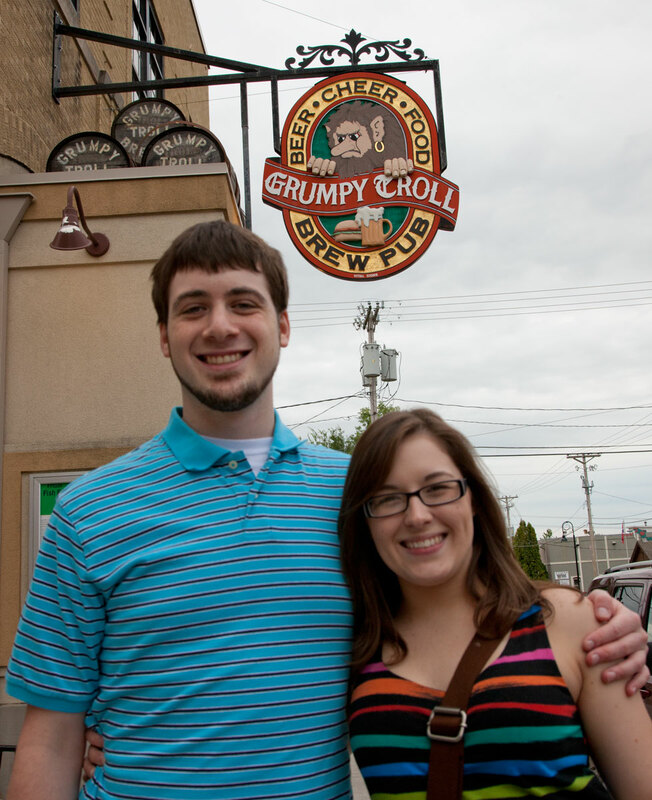 We also made sure to stop by Zingerman’s Deli, a gastronomical institution in the city of Ann Arbor. Yum! Leaving Michigan and entering Illinois, we headed for the big city of Chicago. 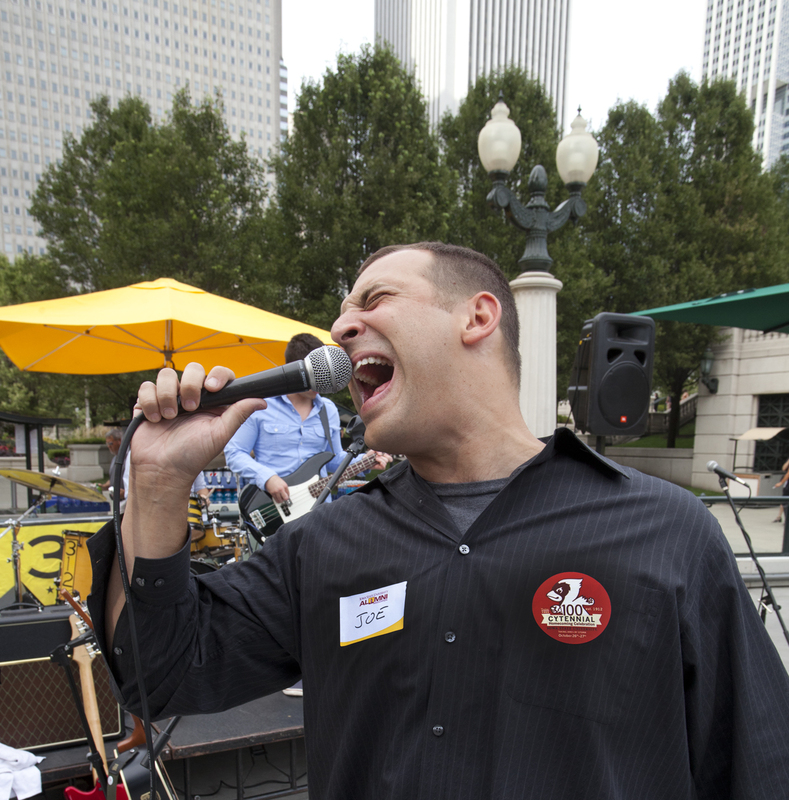 There we had a trio of wonderful interviews and photo shoots with alumni, and we had a rocking good time at the ISUAA Club of Chicago “Cyclone Summertime Happy Hour” event at the Millennium Park Grill (see earlier blog post). 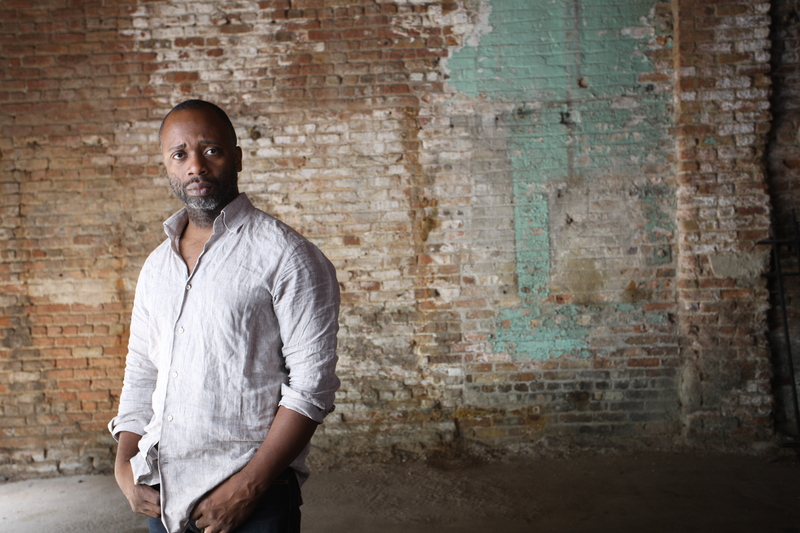 Our first stop was with Theaster Gates (’96 community & regional planning, MS ’05 interdisciplinary graduate studies). Theaster (right) is a hard person to describe in a few words. He’s an artist, an urban planner, and an arts administrator. But within each of those categories, there’s so much more. 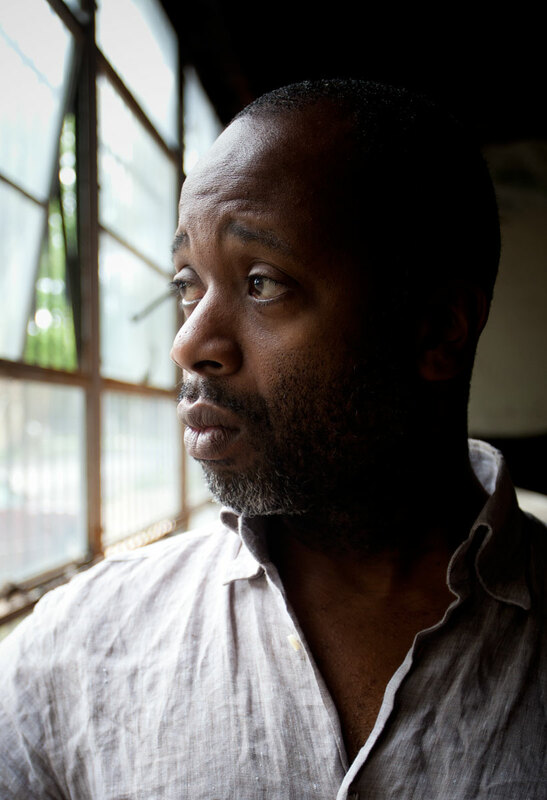 He’s the director of arts program development for the University of Chicago; he’s a potter and installation artist; he’s a community organizer and cultural entrepreneur. We toured a few of the buildings within the Dorchester Project, an area he’s developed for community arts on Chicago’s southeast side. I can’t wait to tell you more about him in the special issue of VISIONS. 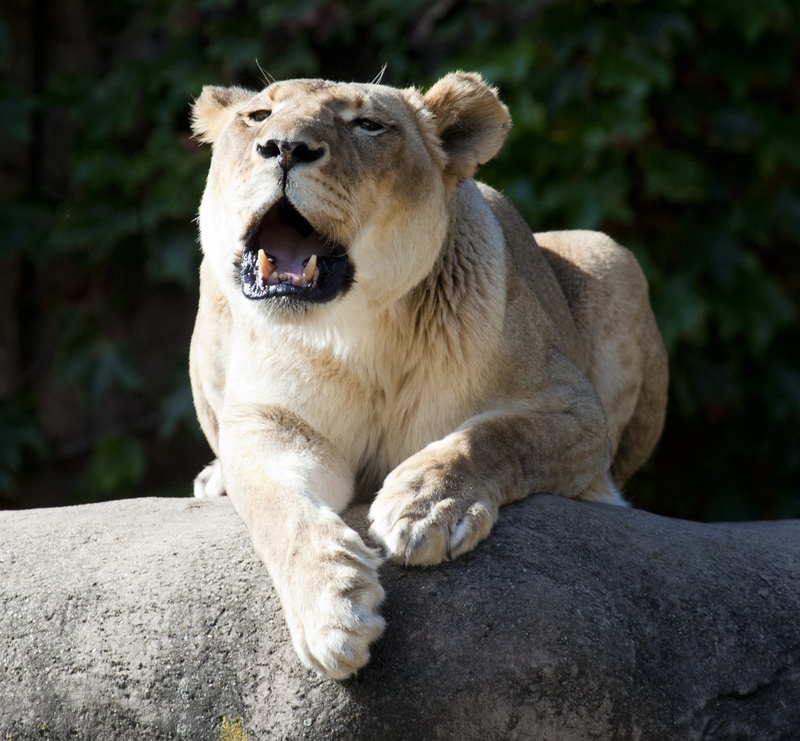 We spent a full morning at the Lincoln Park Zoo – mostly for work, but I have to admit I always enjoy visiting a good zoo. It’s especially fun when you have a tour guide like Anthony Nielsen (’97 fisheries & wildlife biology). 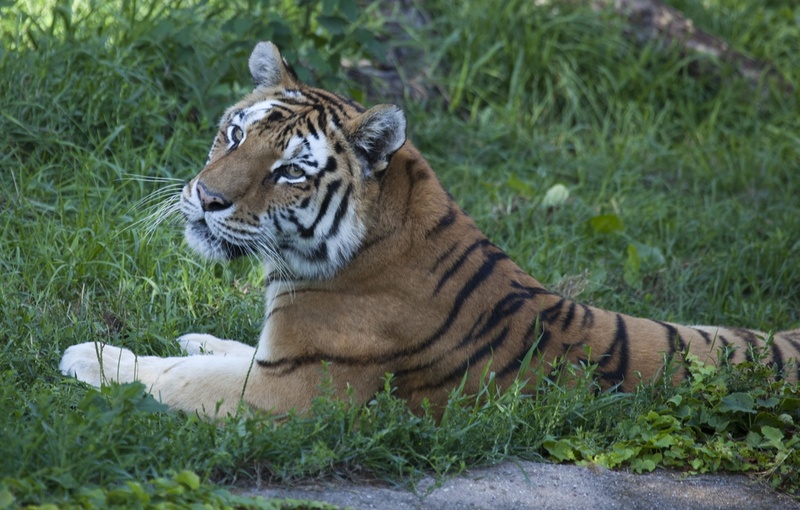 Anthony is the lead keeper of the Kovler Lion House and Seal Pool, and he gave us a behind-the-scenes tour of both. I even got to touch Della, the gray seal. 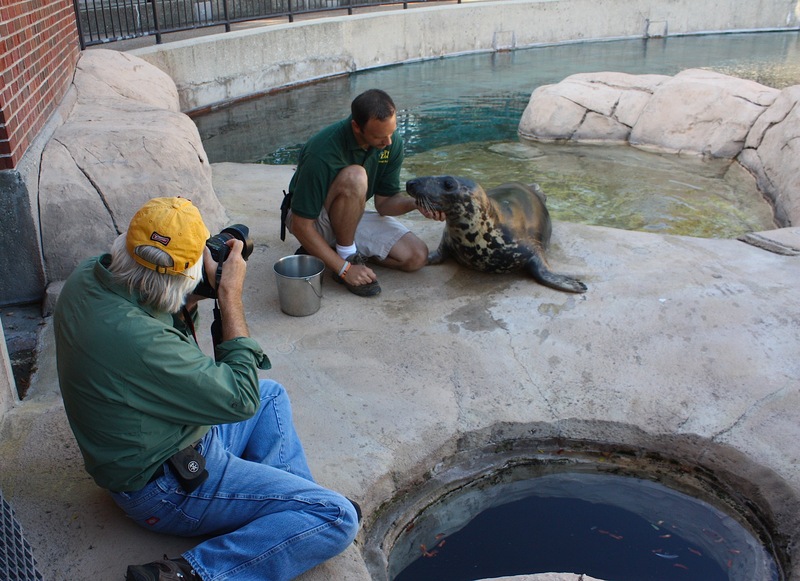 (That’s Jim photographing Anthony and Della in the seal pool above.) 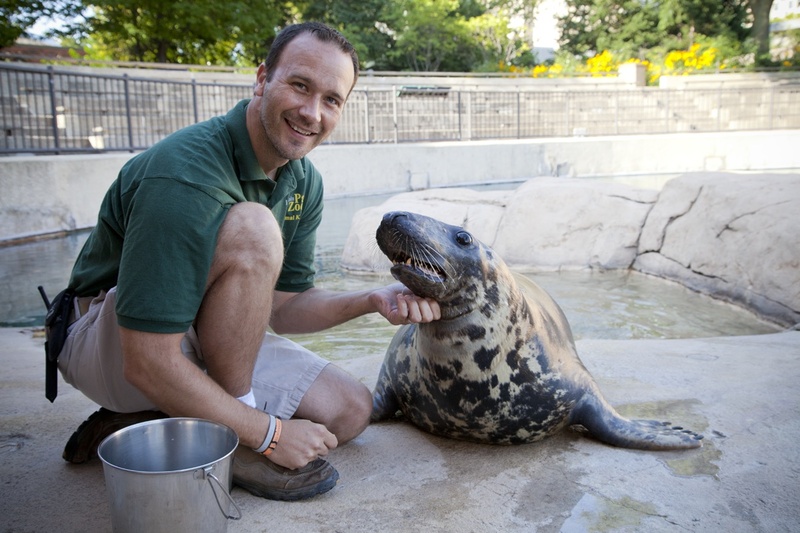 Anthony has been with the zoo for 12 years, and he clearly loves the animals he works with. I’ll write more about him, too, in the coming weeks. Our last Chicagoland meeting was with John Arends (’77 journalism & mass comm) in Batavia, Ill. John is president and CEO of ARENDS, a communication and marketing company founded by his father, Don Arends, who is also an Iowa State graduate (’52 ag journalism). The Arends family has quite a number of Iowa State ties, including being named Family of the Year in 2010. John’s wife, Anne (’78 PE & dance), and two of their three children, Allie and Kate, graduated from Iowa State; son David is a senior this year in kinesiology and health. 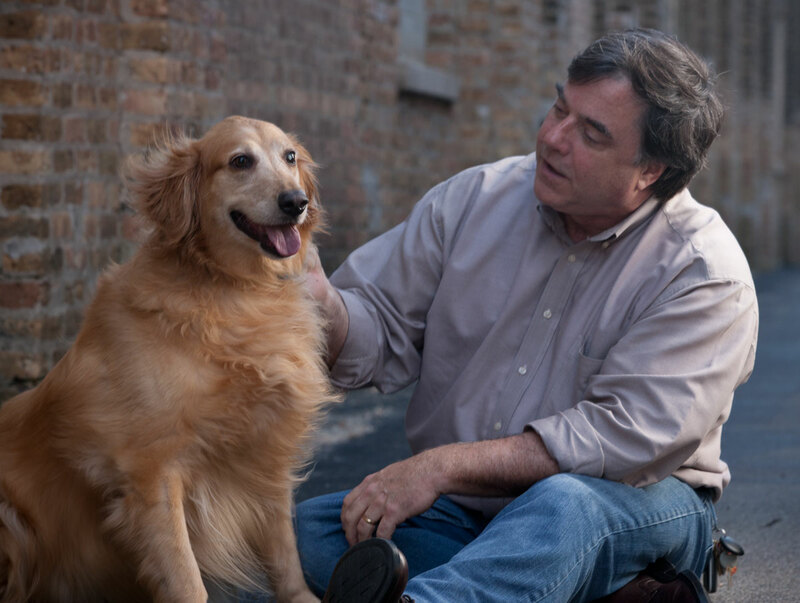 Jim and I spent a fascinating afternoon with John, Anne, and their dog, Ellie, at John’s office, which is located in an 1870s-era former windmill factory on the Fox River. (That’s John with Ellie above.) John has quite a story to tell, and I’m really excited to be able to share it with you (soon, I promise). I love Chicago, but I was relieved to leave all that traffic behind. Our next few interviews and photo shoots were scheduled in southern Wisconsin, an area that just cries out to be photographed. When we weren’t on assignment, Jim and I rambled through the rolling countryside in search of the perfect red barn and the perfect black-and-white dairy cows to photograph. 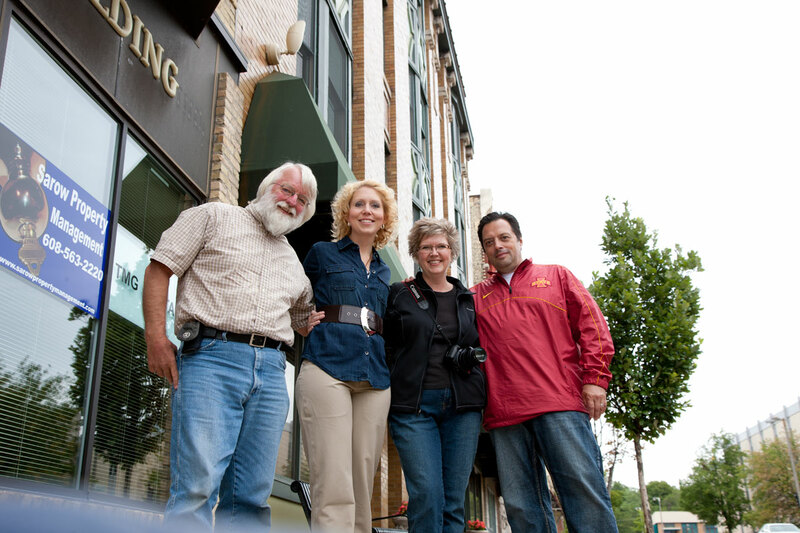 Our first appointment in Wisconsin was with a dynamic duo that has both Iowa State connections and local ties. Kelli Cameron (’02 ag education) and Steve Servantez (’89 DVM) have a unique, interconnected story to tell. They both live in Janesville, Wis., and are equally enthusiastic about Iowa State and about their local community service projects. (Jim and I are with Kelli and Steve above). Next up we met a young couple in Mt. Horeb: Karlee Michalski and Eric Meisel, left. 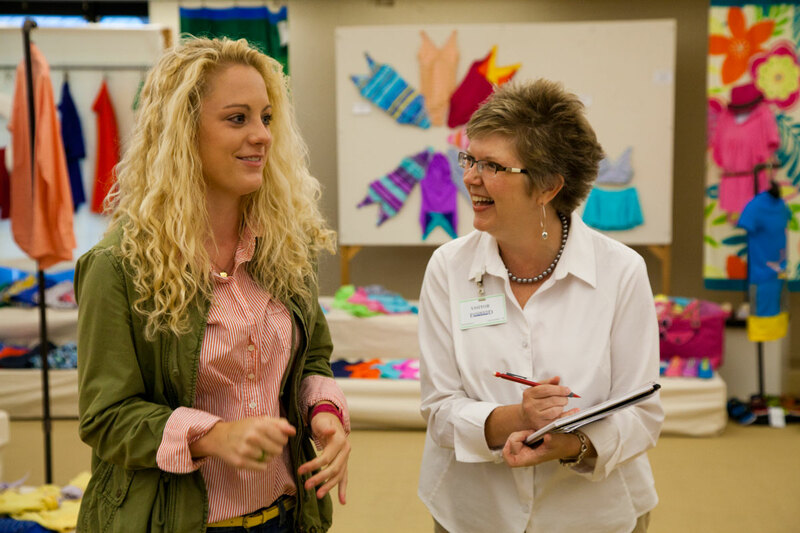 Karlee is a 2010 apparel merchandising, design, and production major who works as an assistant technical designer at Lands’ End. Eric is a data analyst at Medseek, a healthcare software firm in Verona. They are planning a May wedding. I love the story of how they met at Iowa State and how they’re using their degrees in their first jobs right out of college. The next morning we headed to Lands’ End headquarters in nearby Dodgeville. Lands’ End is a big deal in this part of Wisconsin, and a quick look at our alumni database shows at least 30 Iowa State alumni currently working there in some capacity. Chief among them is Chris Kolbe, a 1992 fashion merchandising graduate who holds the title of executive vice president/brand president for the company – one of the very top positions. Chris has also worked for such fashion giants as Ralph Lauren, Saks Fifth Avenue, Liz Claiborne, and J. Crew. While I was at Lands’ End I also ran into Heather Sinclair, a 2011 graduate who practically lived here at the Alumni Center – she was really, really active with Student Alumni Leadership Council, and she worked briefly with me in alumni communications. Heather graduated with a double major in apparel merchandising, design, & production and journalism & mass communication (wow, that’s a lot of “and”s). She now works for Lands’ End as an assistant merchant and seems to love her new job and her new state of Wisconsin. We had fun catching up, as you can see in the photo of us above. 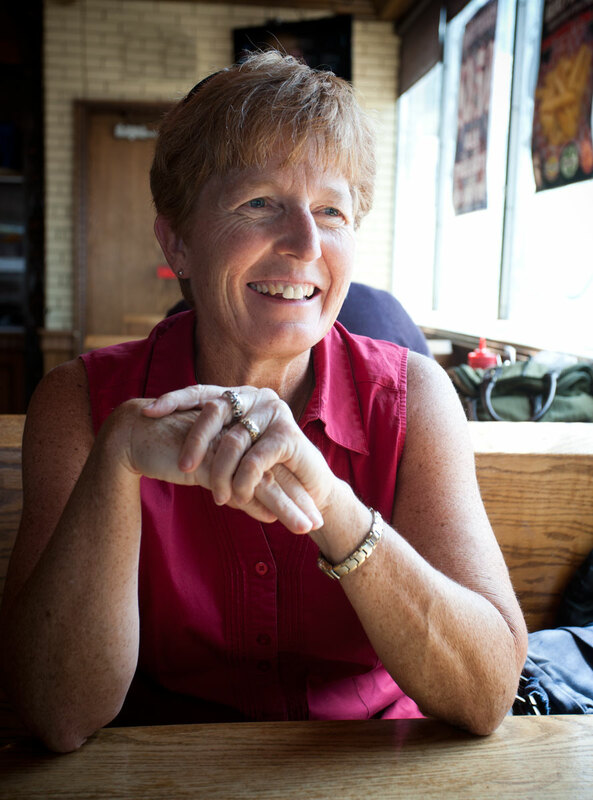 The last Wisconsin alum we met was Faye Perkins (’79 PE & biology, MS ’85 exercise physiology). Faye (left) made my day when she posted a comment on the Wisconsin web page that ended with, “ONCE A CYCLONE, ALWAYS A CYCLONE!! I LOVE ISU! !” Faye is one of Iowa State’s pioneer female athletes, one of our earliest female scholarship winners, and a member of the ISU Athletic Hall of Fame. She’s been a faculty member, administrator, and softball coach at the University of Wisconsin-River Falls. I found our time together absolutely inspirational. At this point, we were three states down, one to go. But I was so enthusiastic about the story potential in Minnesota that I scheduled seven alumni in that state. So we still had our work cut out for us (and another three days on the road). As it turns out, I am not the least bit sorry I “overscheduled” us in Minnesota, because the alumni we met there were outstanding, and every one was unique. First off: Ron Schara (’66 journalism). If you live in Minnesota, and if you are a hunter or fisherman, you know Ron Schara. Even if you don’t live in Minnesota, if you are a hunter or fisherman, you probably know Ron Schara. He’s a living legend. Ron is the executive producer of the popular television show “Minnesota Bound,” which he hosts with his black lab, Raven. We met Ron and Raven and got to sit in on part of the outdoor filming of one of his shows. If you can’t wait to read more about Ron, you can watch episodes of his shows online. 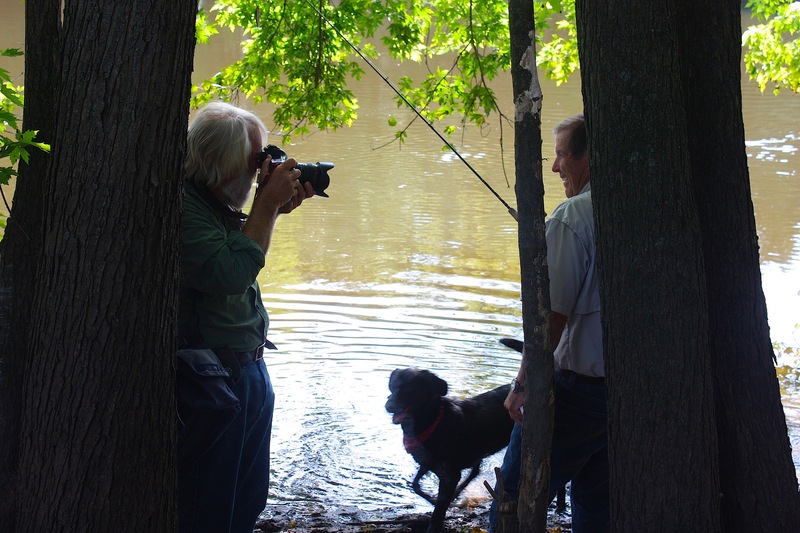 That’s Jim photographing Ron and Raven by the Rum River. The next day, Jim and I once again found ourselves on a university campus: the University of Minnesota’s main campus in Minneapolis. There we met with Louis Mansky (MS ’86 microbiology, PhD ’90), a professor and director of the Institute of Molecular Virology. Louis (shown at right in his office) spends his time focused on the important study of the HIV virus and how it evolves and mutates. Fascinating stuff. It was a thrill to meet our next alumna, Ann Lindemeyer Burckhardt (’55 home economics journalism), because I grew up with her cookbooks. Do you remember the Betty Crocker cookbook? I think my mom had several versions. For a long time, that cookbook was THE go-to gift to take to a bridal shower. And Ann was the editor from 1956 until 1963. 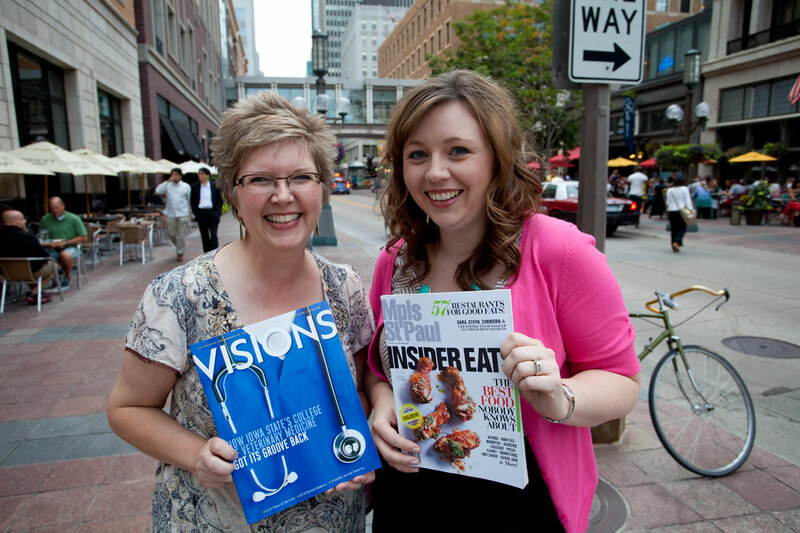 She also published 11 cookbooks of her own and wrote for the food section of the Minneapolis Star Tribune for 24 years. I could tell you more about her, but then I’d give away all the good stuff. 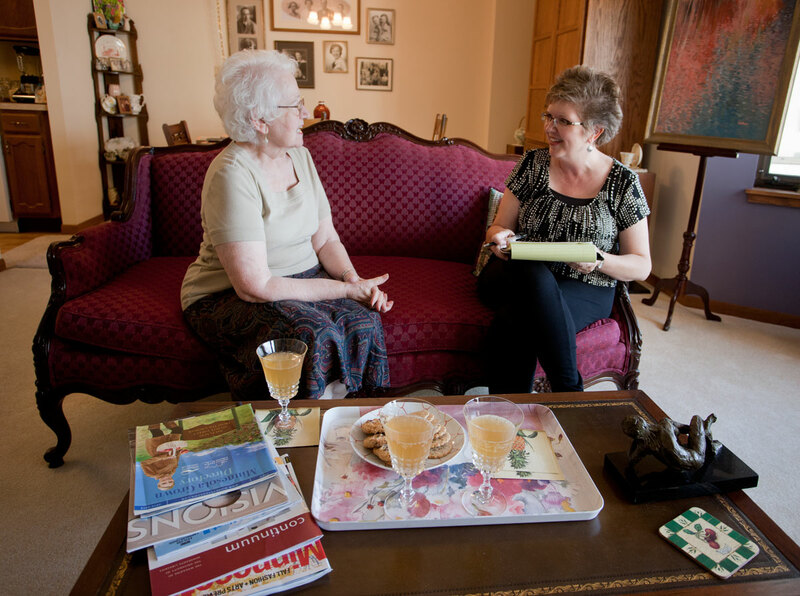 Needless to say, we spent a delightful afternoon with Ann in her Edina apartment (above). 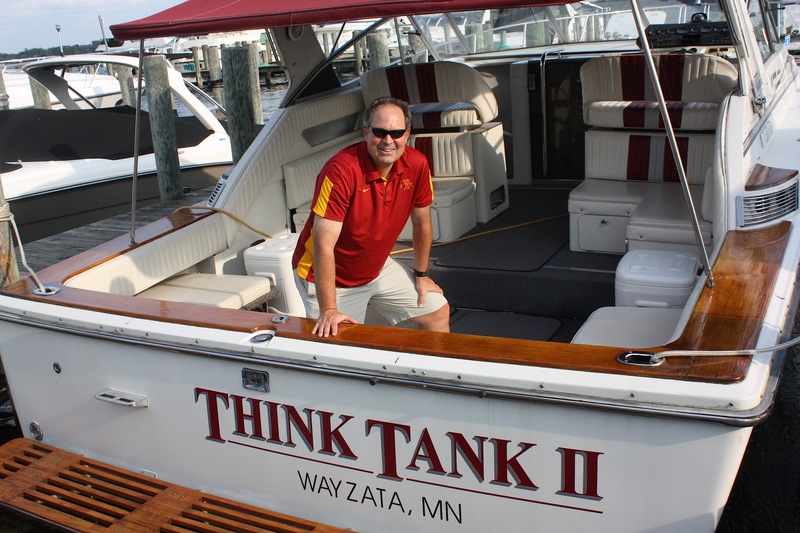 Later that day we met Jeff Prouty (’79 industrial administration) for a decidedly NOT difficult appointment – on his boat in Wayzata. He had offered the opportunity for Jim and me to take a spin with him on Lake Minnetonka and said we could invite a few Iowa Staters to join us. I immediately called Russ Snyder (’73 landscape architecture), our ISUAA Club of the Twin Cities president, and he put together a small invitation list that included club leaders and members of our Young Alumni Council. 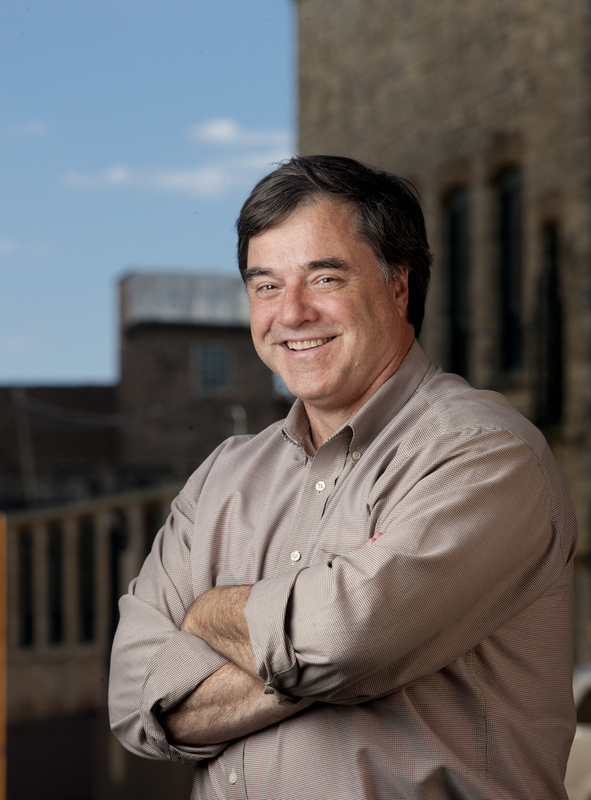 Jeff is a management consultant and the chairman and founder of The Prouty Project in the Twin Cities. We had a thoroughly relaxing evening on his Think Tank II (that’s Jeff with the boat above). It was the perfect way to end the day. The next morning we left Minneapolis and headed to the southeast Minnesota town of Rochester, home of the world-renowned Mayo Clinic. 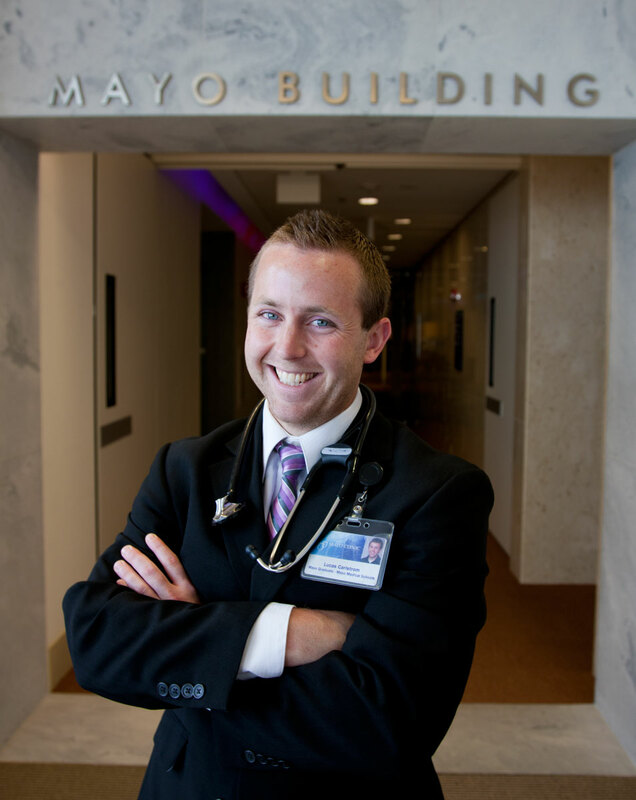 There we met Lucas Carlstrom (’08 animal science), an MD and PhD student in molecular neuroscience at the Mayo Clinic College of Medicine. Luke (left) is starting the fifth year of an eight-year program there, and his list of accomplishments is already impressive. And, finally…drum roll, please…our LAST interview on our LAST DAY on the road (for awhile) took us to the Prestegard Farm in rural Frost, Minn. A recent graduate, Richard Prestegard (’02 ag business) works with his father, Al, who attended Iowa State back in the early 1970s in farm operations. 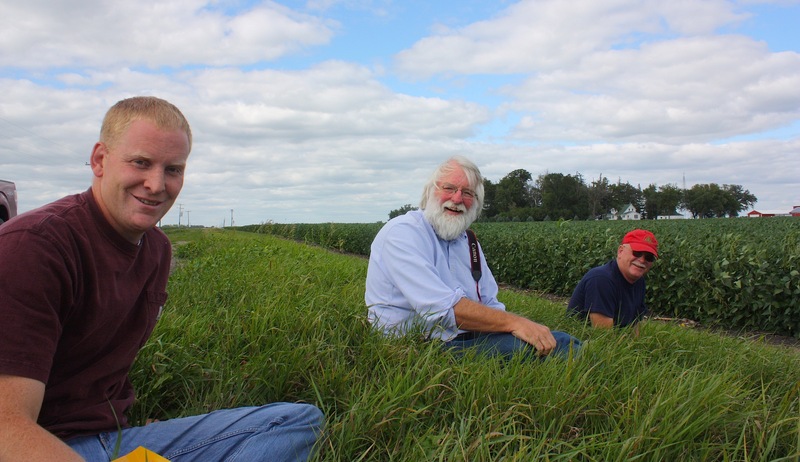 (That’s Richard, left, and Al, right, chillin’ in the field with Jim.) They currently farm land that’s been in the family for five generations. Their corn-and-soybean operation offered a dramatic backdrop and a perfect end to a fantastic trip to the upper Midwest. 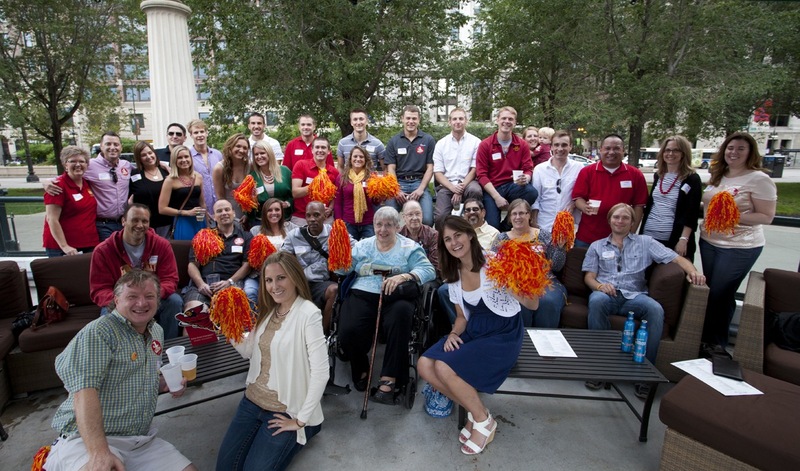 Jim and I were blown away by the number of happy, enthusiastic Iowa State alumni (and their friends) who turned out for the ISUAA Club of Chicago’s “Cyclone Summertime Happy Hour” held last Friday (Aug. 10) on the patio of the Millennium Park Grill during our VISIONS Across America tour of the upper Midwest. It was a beautiful night to be in downtown Chicago, and the Cyclones just kept coming. I think all told we must have had upwards of 50 people show up between 5 o’clock and the time we left, and everyone seemed to have a great time. I have to give a special shout-out to club leaders Scott DeKoster (’02 advertising) and Leslie Blake DeKoster (’03 industrial engineering) for helping to plan and promote the event. Scott arrived at the Millennium Park Grill TWO HOURS prior to the start of the event just to save enough space for the Chicago Cyclones to gather in the popular, no-reservations-accepted outdoor bar area (I eventually showed up with some stand-up Cys and cardinal & gold pom-poms, which seemed to help define the gathering space.) 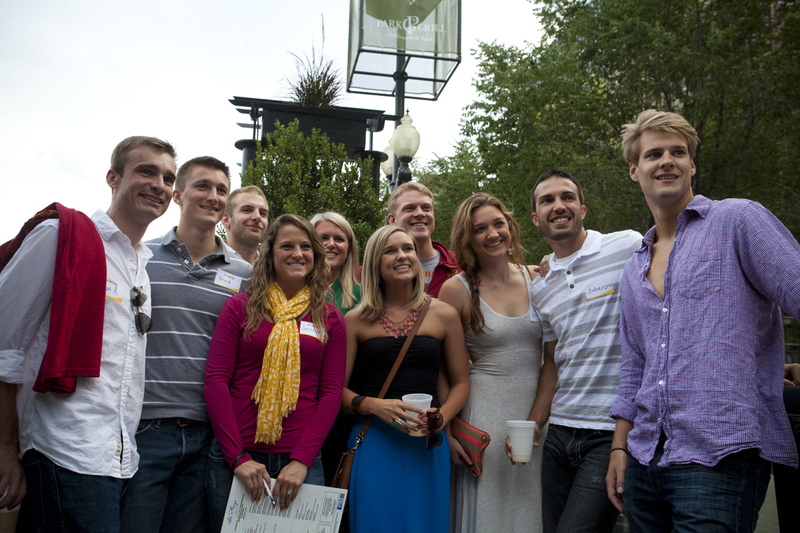 Soon Iowa Staters began arriving in droves, in grad years ranging from 1956 to 2012. Even the band, The Walk-ins, got into the Cyclone spirit. Lead singer Joe Matise wore an Iowa State nametag and a Homecoming sticker and even joined us for a few group photos. 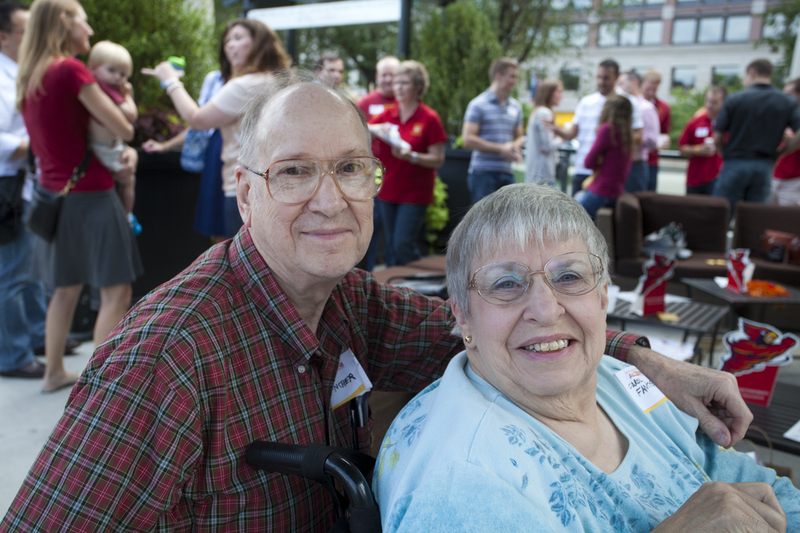 Here’s Jim Fancher (’56 electrical engineering) and his wife, Carol, enjoying the festivities. 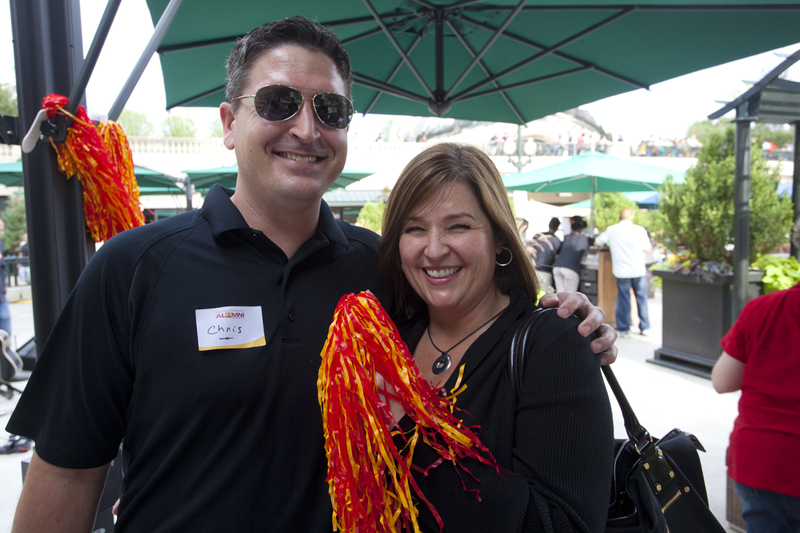 Chris (’01 management information systems) and Kristen Collins (above) have one of those “mixed” marriages: Kristen didn’t attend Iowa State; she married into it. But you’d never know. She was one of the most enthusiastic Cyclones in the group. 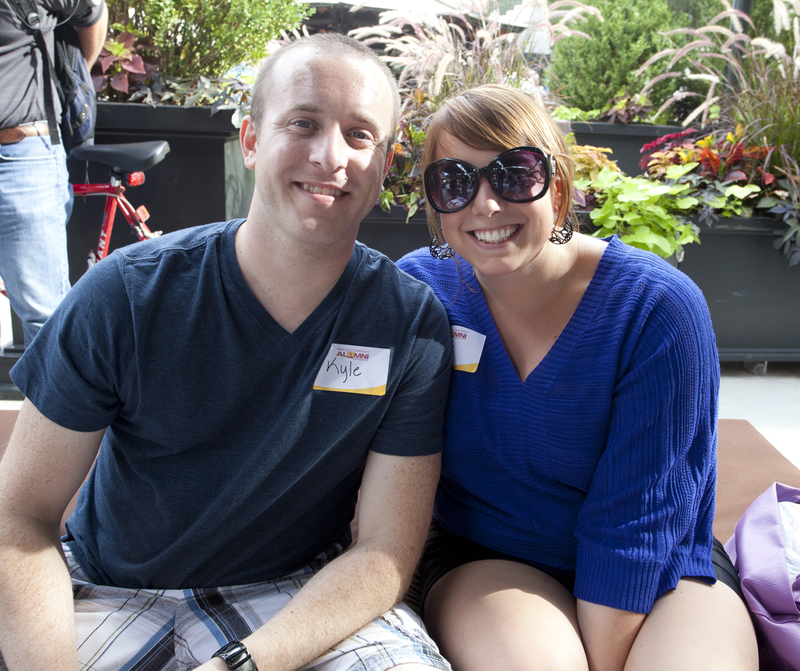 We even had a couple from West Des Moines join our group. Kyle Nielsen (’07 journalism) and Allison Roby (’09) had just arrived in Chicago on vacation and saw the cardinal & gold, so they thought they’d stop by. Thanks, Chicago. We had a fantastic time!